On Thursday I delivered my new work for Regent Brass, ‘Dance of the Groovy Spirits’ & some revised bass parts to my ‘Fanfare for Celebration’ Although not everyone was there, as it was their first meeting after the Summer break, they sound Fantastic, & they seem to like the pieces. The bad news is that Jane Brewster, who teaches the young violinists for whom I write a small part of a large orchestral work every year, has been told that the school no longer wants the children taught violin, they’re going for ukuleles instead!!! How pathetic – why can’t the school offer both? 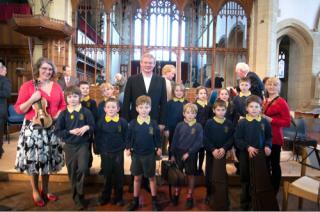 The Head does not appear to value the fact that for at least 4 of my 9 years of setting musical stories for Dorset Orchestra, with Martin Clunes as narrator, the children have had the experience of playing with a good adult orchestra, not to mention performing with a famous actor & TV personality. I can write for ukuleles, if necessary, but orchestral opportunities on the ukulele are limited. On the violin early experience can lead to a lifetime of opportunities.